“If it has been done, then it is possible”. Putting it simply, what this means is that if someone can do something, then I can do it too. But there are so many times that I hear the opposite being said. Now, I certainly cannot get out there and run a sub-ten second one hundred metres. Due to physical limitations. And when it comes to a lot of things, it is really only mental limitations that prevent us from trying something. It isn’t that we cannot do something..
It’s only that we believe that we will not be able to achieve what we want to achieve. We impose our own limiting beliefs upon ourselves. And so we never even make an attempt. Why do we not make an attempt? What is it that holds us back, that prevents us from taking that first step forward? Is it because of fear of failure? Is it because we believe that we WILL fail, and when we do fail, we will be embarrassed? Or is it because we have a limiting belief in our minds that we are not WORTHY of the spoils, and the glories and the accolades and the triumphs of making that change, and taking those steps? No matter how much success and change and improvement awaits us for doing so? Look on back at your dental school undergraduate years. Who were the high achievers? Who were those who had the great hands? Who were those who mastered the skills required quickly? Look at your dental school classmates today. Who are those who achieved some greatness? Who are the dental entrepreneurs? How do those two pictures compare when we compare then and now? In the same way that none of us were born with a handpiece or a laser or a CADCAM in our hands, none of us were also born with a knowledge of the secrets of running a successful business. My point is that business skills are learned in the same way that clinical skills are learned. And in the same way that clinical skills can be taught successfully to a new year of undergraduate students arriving at University each and every year, then business skills and knowledge can also be imparted upon all who graduate from Dental School. And yet some dentists go on to be very successful Dental Practice Owners, while others just seem to only be getting by. In the same way that business skills can be learnt by some dentists and not others, business skills can also be learned by some Dental Office team members and not others. The choice of acquiring knowledge and assimilating the use of that knowledge is available to us all. After all, library cards are free. So it is indeed a choice. As practice owners we can ignore the fact that knowledge is abundant, and try to simply just get by. Or we can go out and seek that knowledge, acquire it, and put that knowledge to good use. And help others in our business to attain more knowledge, and learn it, and use it, so that our business is able to obtain a competitive advantage in the market place. The reason that one Dental Office is more successful than another rarely relates to the clinical abilities of the Dentist. What that success relates to is the commercial skills that that dentist and his team have acquired, learned and put to use to differentiate their Dental Office from its competitors. Your patients don’t care how great your margins are if you’re continually keeping them waiting. Your patients do not give a hoot how much CE you’ve done if your front office team ignore them upon their arrival, and then park the patient in some holding area while they return to talking to each other about how much they “need a coffee” and how much they are looking forward to “ the day going faster”. Your patients just want to be pampered, and made feel special. There’s a behaviour going on in all Dental offices across the country that is totally wrong. Yet those who do this behaviour do so as if they believe that they are actually doing nothing wrong. They carry on as if their behaviour is totally acceptable. And for the life of me I do not know why they would even think that way? Because the behaviour is indeed rude at the least, and uncaring and obnoxious at the worst. What is this behaviour that exists in Dentistry, that is harming your Dental Practice, like a silent killer? It’s the act of leaving the patient unattended. A paying customer is left, on their own, to contemplate only the room decorations, the architecture, and also all of our decorative defects. And yet for some reason, our dental team members feel that this abandonment of the patient is totally acceptable behaviour. And often we as dentists and business owners are not even aware that this abandonment is going on! At my workshops I tell this following tale often. And the reason I tell it is because something like this *NEVER* would happen at the practice that I previously owned and operated for twenty-eight years. When I finished up at my old practice, I was offered the opportunity of seeing patients one or two days a week by a Dental Practice only nine minutes walk from my home. And although it was a position that I had not sought out, I thought it would be a nice way to “keep my hand in”. Anyway, on one day there, I was sitting in the tearoom when one of the dental assistants informed me that my next patient had arrived for treatment. So I asked the dental assistant to bring the patient down, and I allowed a minute before I then headed to the treatment room. Well, when I arrived, to my surprise, the patient was seated and bibbed up in the dental chair, *ALONE* in the treatment room, simply staring, looking forward, staring at a blank wall. What surprised me about this was that on this day I was the only Dentist working and the practice had two Dental Assistants and two front office people there. Yet nobody could be bothered to sit with the patient and talk and “visit” with them for sixty seconds until I arrived in the treatment room. And the patient was due to be spending $4600.00 on dental treatment this day!! I know that if I was a customer at a business and was due to be parting with a fair chunk of my readies, I’d be expecting much more attention than this abandonment I had just witnessed. In fact, in that sort of situation, I’d have been more than likely to drop what I was about to be purchasing and gone elsewhere with my business. And yet at this Dental Office it seemed to me that regular patient abandonment was acceptable behaviour? Because when I went looking to find an assistant to help me, I found one was making her breakfast [on company time] while the other was putting away some stock that had just arrived. A similar thing happened in a double whammy effect to a dentist friend of mine only this last week. My friend was treating a patient, when the hygienist came to notify my dentist friend that he was needed to do a hygiene check on the wife of the patient that he was treating. My friend let the hygienist know that he would be there in one minute, but when he arrived in the hygiene room guess what he saw? One patient left alone staring into space at a wall, and no hygienist or hygiene assistant for that matter to be seen. So my Dentist friend conducted the examination. Apparently the hygiene assistant returned…. Anyway when my dentist friend returned to his own treatment room to resume with his patient can you guess what happened? Yes, one patient, on his own, solo. With no Dental Assistant. My friend could not believe that the dental staff thought that patient abandonment like this was actually acceptable behaviour. Especially when his two patients were spending in excess of two thousand dollars at his office on this day. It’s my belief that at no time should a Dental Patient ever be left unattended and on their own alone in the Dental practice. And in the dental chair is by far the worst example. But there are other places in the Dental Office where patient abandonment goes on, and with harmful effects. We often hear of patients who are abandoned after treatment and have to find their own way from the treatment room back out to the front desk. And at other times, the patient is brought out to the front, but abandoned and left alone because of a logjam there. And in this case the assistant believes that it is far more important to be cleaning an inanimate dental chair rather than entertaining and attending to a real live patient who is about to give the practice some money. Even when patients arrive for their appointment they are often parked and abandoned in a room with a pile of old magazines, brochures and if they are lucky, a fish tank, while they wait their turn to be called for treatment. And often while waiting there they can overhear two receptionists discussing their private lives. When really these employees should be engaging with the paying patients. Every time we abandon a paying patient and leave them on their own we are actually facilitating a mental disconnect for that patient that needs to be broken and reconnected. And that is unnecessary hard work. Because the abandoned patient is not sitting there alone deciding whether they’re going to be having the chocolate cake or the bruleé for dessert. When we abandon the dental patient we are actually allowing them time to think that maybe there is some place better than this where they will be better cared for and looked after. Especially when they’re handing over hundreds and thousands of dollars at appointments. Have you contemplated how much damage your dental abandonment is costing you in mental disconnects? Patients with mental disconnects will defer more, and appoint less. Because we’ve dumped and abandoned them unnecessarily. They’ll go looking for somewhere else to get their dentistry done. They’ll look out for somewhere where the dental staff actually gives a hoot. What’s so sad about this story on abandonment is that those who perpetrate the mistake do not even feel that they are creating or making an error. They have no idea that their behaviour is totally unacceptable. Hire Slowly and Fire Quickly. Usually, in dentistry, it’s the other way around. Usually dentists, as business owners, tend to hang on painfully to team members who they should be letting go quickly. Whether we are owners ourselves, or whether we are fellow team members. Our practice keeps people who really are not doing the best thing for the practice. This may include team members who are “going through the motions” as well as team members who just do not “get it”. Team members may be going through the motions because they are not comfortable with the direction the practice wants to go or they are not comfortable with the directives they are receiving from above. Maybe the practice has a new direction? Maybe the practice is now promoting a new or different treatment philosophy or treatment modality that the team member is not in agreement with. I’m not sure why those team members are not on the “same page”? Because those team member’s duty really is to tow the company line. Just like in the army, they need to follow orders. If they don’t agree with the direction that the practice is now heading, treatment wise, and they are not the owner, what gives them the right to pass judgment? There are team members who feel that their boss, the dentist, is charging too much and making too much money. And so they apply the “virtual handbrake” to the practice. When questioned privately by the patients these team members do not support the dentist’s diagnoses. They fail to apply discipline to appointment scheduling and to appointment rescheduling and cancellations. By their own actions and inactions they sabotage the success of the practice, by getting on the financial side of the treatment equation without ever considering the health consequences of delay and inaction. They feel “sorry” for the poor patient without even asking whether the patient can manage via other means. We also have onboard terrorists who work in the Dental Practice. They behave in the same manner as the scorpion in the tale of the frog and the scorpion. They’re as nice as pie when they need to be but they’ll backstab and purposefully sabotage and destroy if it means they can stop someone else, or the practice itself, from succeeding. And then, there are sometimes those who mean well, but simply just do not have the skills required. And though it’s always nice to be supportive of these people, if they’re not up to the role they need to fulfill, then they’re simply in the wrong place at the wrong time and we need to let them go. Whatever the reason that an employee is inappropriate, most dentists will hang on, and hang on, and hang on, and hang on to the grim death, rather than pull the trigger and let that person go. No, they hope and they hope and they hope that this employee will miraculously change for the better. And I’m here to tell you that 99% of the time, sadly, change for the better does not happen. We need to be on top of this thought. We need to have the ability to fire quickly. Because we do not fire quickly, we then drag on and drag on and drag on, so that when we finally have a change of team member thrust upon us, we end up on the short end of the stick and we end up needing to find a replacement quickly. Often we are then rushed to choose the first candidate, or one of the first applicants, who looks like they might be OK at doing what we need them to do. And again, this often ends in disaster. We hire without the right background checks and reference checks being conducted. We believe what is written in the CVs, and funnily, we believe what we are told during the interview. We ignore telltale warning signs that we later recognise, after the event, as being true red flag indicators that danger is imminent. Because we need to have a body there answering the phone, assisting our dentists, or cleaning our patients’ teeth. Who cares about the references? I think that dentistry, by itself, lends itself to employment failure because of all the reasons I’ve mentioned, as well as because that most often, the employer is always working with his eye away from the business [and on the patient] and therefore is nearly always unable to fully supervise the integration of the new team member into the practice operations. And so we so often set ourselves up for imminent failure. As practice owners, if we can hire slowly, with correct interviewing and employment trialing protocols, then we can drastically reduce the errors we make by hiring too quickly. And if we then hire appropriately, we then find we have less reason to fire quickly. Are You Training Your Team Or Simply Writing Policies? Today’s blog feels like the Beatles’ song “A Day In The Life”. It’s as if I’ve written about two different topics, loosely tied together under one title. You need to train your staff. You need to train them so that what they need to do becomes ingrained and second nature. I received a great email last week reminding me that sometimes as business owners we take a lot for granted. The email was a reminder of some of the little things we do, and do not do, as business owners, that indeed sabotage our business, without us even realizing that we are doing them. I was reminded of these, and that there is always a better way, when I visited a dental practice last week. At this practice I was able to offer a few easy to implement suggestions that saw an immediate increase in appointments made and appointments kept, along with a reduction in the number of cancellations and no-shows. It wasn’t so much *what* I said that caused these changes. It was indeed the fact that I was there in the first place to be passing a guiding eye over the operations that allowed me to contribute positively. At your Dental Practice do you have a guiding influencer regularly attending and overseeing and adding value to your operations? One of the most valuable golf lessons I ever had was from my coach and mentor Bruce Burrows, who came and sat in on a practice session I was having at the golf driving range. I regularly had lessons from Bruce there, but on this occasion, when I turned up this time just to hit a few balls on my own, Bruce was not teaching, and so he came over and offered me some of his thoughts. Now, I could have booked and paid for a lesson. Or Bruce could have sat inside and had a coffee instead of coming out and watching me. But there’s something much more beneficial that was happening here. And that is the advice coming from a mentor, and not just from a CD, or a book or a DVD. The email reminded me of the concept of *Oversharing*. Oversharing is something that most untrained employees do regularly, day in and day out. Oversharing can be the process of letting the customer know un-asked-for information that is really irrelevant to the customer. Oversharing can also be the discussion of inappropriate personal topics as well. Both are really none of the customers’ business. The customer does not need to know about backstage errors, mistakes and misdemeanours. They don’t want to know about your latest ailment, or whether you are hungry, underfed, or in need of a coffee. The customer just wants an Ultimate Patient Experience. The customer wants the experience they were expecting. They don’t need to know that something went wrong. Or that you have something wrong. Or that you have some personality disorder. They only want to know that everything is all right. The email, from my friend and mentor John DiJulius, explained the crux of the whole situation, and that is that whenever oversharing occurs, it is really not the employee’s fault. He says that most of the time employees have no idea what is considered oversharing. Employees do not realize that what they are saying is unprofessional. This emphasises exactly how important it is to constantly be training employees about what is professional and appropriate and what is not. And by training, I mean TRAINING. Not a policy, or new policy. And training is repetition…over and over until a habit, or new behaviour is created. Because a policy alone, buried inside a binder, book or folder, won’t cut the mustard. The behaviour needs to be taught, nurtured and learned. So what are some things that could be said that would constitute oversharing in the Dental Office? Whenever a conversation in the Dental Office begins to become less than professional, and others can overhear it, then it needs to be changed. Sometimes it is a team member, but sometimes it could be a patient who may be oversharing something personal within earshot of other patients, or other team members. If this happens then your team members need to have a signal or code. This is code meaning that your conversation is too loud, and inappropriate, or both, and the topic needs to be changed. Be we the dentists, the office managers, the hygienists, the dental assistants or the receptionists. And the poke was more than once. Because it takes time to train the mind to do and say new things. You simply just can’t tell the mind to change. You need to MAKE the mind change, by training it. Are you training your team, or are you simply writing new policies and procedures? I think it’s an untruth…. If you run a business the wrong way you can end up in a lot of trouble. And what would be the point of all that? Provide profits to its shareholders who in turn spend those profits within the community. Running a business that is not profitable is a not a very nice way to exist. It’s no fun living hand to mouth, or worse still, not even drawing a wage from your business as the business owner. For a Dental Business, the numbers should be fairly straightforward. 35-40% of the collections should be paid as salaries to the employed dentists [including any owner dentists] for their dental expertise. 20% of collections should be paid to all other staff of the practice as wages, and benefits. And 20% should be held over for capital expenses, loan repayments [principal], sinking funds, and for marketing, and for dividends to the business owners. If your overheads do not follow these simple guidelines, then you need to talk quickly with your CPA or your accountant. Private living expenses for the dentist, like holidays, investments, and school fees etc. need to be funded out of their salaries for performing the dentistry [the 35-40%] and not from the operational 60-65% needed to support the dental business. Education and practice management need to be allocated correctly. Education of the dentist as a dentist should be an expense of the dentist and not of the practice. 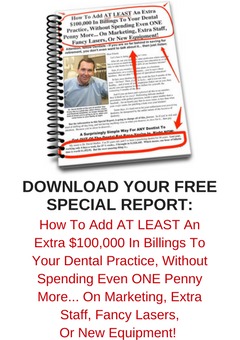 Practice management of the dental facility and of the dental team should be drawn primarily as a capital expense [an investment] rather than as an operating expense, or cost. Both forms of education should be looked at critically in terms of R.O.I. [return on investment]. Why have I not acted on this information? If I have previously acted on this information but have somehow ceased for some reason, what is that reason? And should I begin acting on this information again, this time more seriously? Going to endless seminars, taking good notes, and then popping those notebooks on your bookshelf doesn’t really make much sense? Taking action on what we’ve learned is paramount. We’ve all done it though. We’ve left a course excited about what we’ve learned, and walked into our office on the Monday morning all full of enthusiasm, only to realise that one month later, two months later, three months later….we’re not doing anything different. Was it Five Month braces? Was it World Class Customer Service? Was it better Phone Answering Skills? Larry Winget said “You’re where you want to be because that’s where you want to be” and if you wanted to change it you would change it. There’s a right way and a wrong way to run a business. Going around in circles, with no plan? Well that’s the wrong way. If you keep on doing what you’ve always been doing, then you’ll keep on getting what you’ve always been getting. And if you’re not happy with what you’ve been getting, and where you are right now, then you need a change of plan. And there’s plenty of good help available.